My first piece of advice is not to be fooled by the front door. It is more of an ornamental feature than a door. You need to walk past it and you’ll see a small alley to the right, just a short walk down there will lead you to the actual entrance. So with that mystery solved we left the chilly weather outside and were embraced by a wonderful warmth inside. I assumed it was the wood fired ovens doing such a spectacular job of keeping the place so toasty on a wintery evening. Our friends had arrived moments before us so we spied them in our designated booth and wandered over to them. Really great fit out. 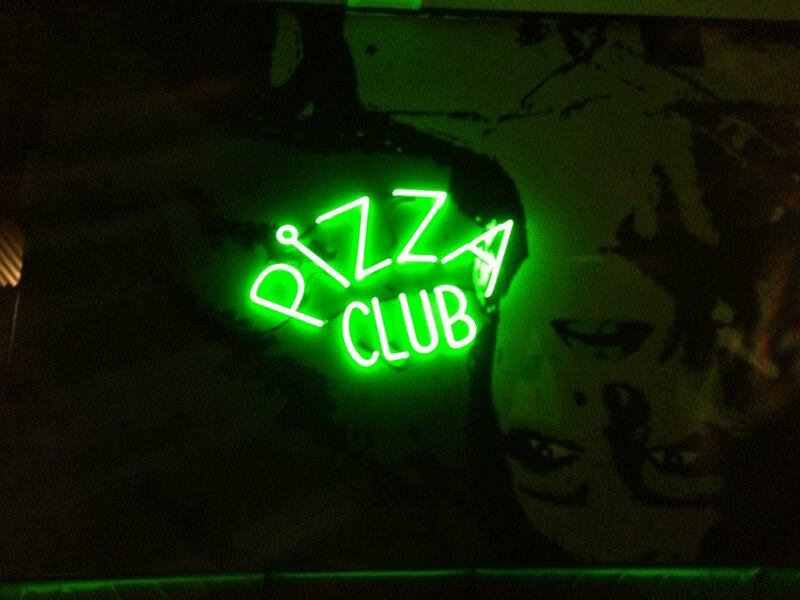 A trendy feel to it, with a splash of retro chic with the glowing green Pizza Club sign. It all works a treat. A range of different seating options are available, including several stools along the bar, which overlook the kitchen area. They have a short but interesting wine list, including a few international options, so we each ordered a glass of something different and turned our attention to the food. Their menu is broken up into “Things from the kitchen”, which are essentially small shared plates, then “Wood Grilled Things” which are some larger mains options and then the star attraction – the wood fired pizzas! Not a crazy long list of choices, but more than enough to keep things interesting. I was more than a little peckish so supported the decision to start with a Prosciutto Plate ($11)and a service of the Fried mac and cheese ($7). I’ve been a fan of deep fried mac and cheese since first trying it at the Merrywell. Granted it is definitely not something you should eat every day but on the odd occasion the deep fried cheesy goodness is an indulgent delight! 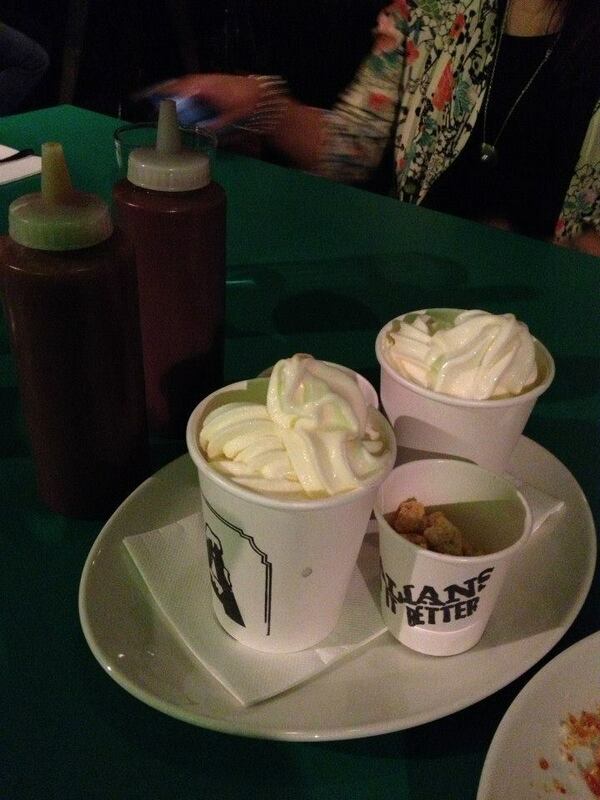 Our drinks and starters soon appeared and both presented well. 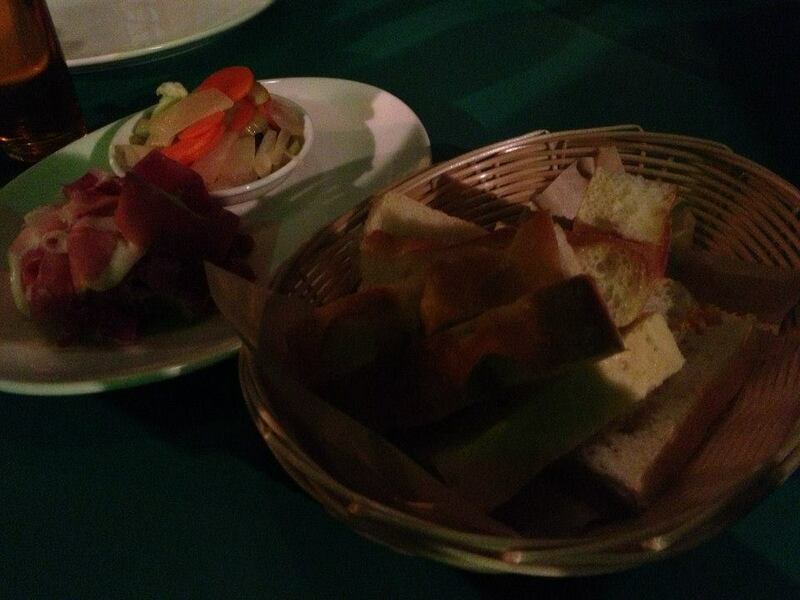 The thinly sliced prosciutto was served along with some slices of freshly baked bread and a dish of pickled vegies. I quite liked the combination of some of the salty meat along with the zesty veg carefully balanced atop some of the bread before it was eagerly chomped. All very nice. The mac and cheese was a serve of two so a deft cut through the middle of each solved the problem for our group of 4. It was fabulous. I am confident I could have eaten both of them solo but I knew pizza was on the way so the more modest half I did eat was for the best. They didn’t take too long to appear and for me it was love at first bite. 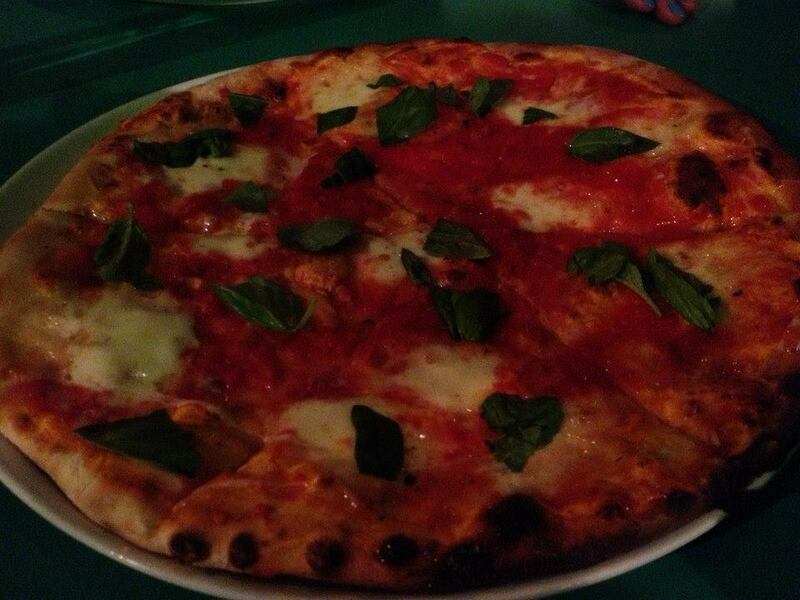 The base was thin and crispy perfection and I am now a massive fan of San Marzano tomato sauce. I wasn’t overly familiar with San Marzano tomatoes, but as I learnt from Wiki – “San Marzano tomatoes, a variety of plum tomatoes, are considered by many chefs to be the best paste tomatoes in the world”. I can’t argue with that. They had a beautiful flavour. I started with the Baby Blue Eyes and I enjoyed the chunky pieces of homemade sausage, again, kicking goals on the flavour front and I also liked the addition of kale. Somewhat of a trendy ingredient these days and not one I had often, or more rightly ever, seen on a pizza. The combination worked well. On this pizza and with the others the toppings were fairly sparse, quite minimalist, but it really worked well and meant that the base and the tomato paste had to shine and they totally did. The mushroom pizza was slightly more ample of the topping front and I have long loved mushrooms and thyme combining forces. It’s a winner. Of the three we started with, the consensus seemed to be that the Ms Loren was the favourite. The spicy sausage did have a good kick and the citrus infusion of the lemon ricotta was very tasty. Now the lightness of the base meant these pizzas were very easy eating, so at the end of these 3, Mr M and I decided we’d order another and went for The Op – San Marzano tomato, mozzarella n basil ($17). Despite the place having filled up considerably by this time, pizza number four didn’t take too long to arrive. I’m so glad we did because I think it was actually my favourite. It was just so delicious in all its simplicity. 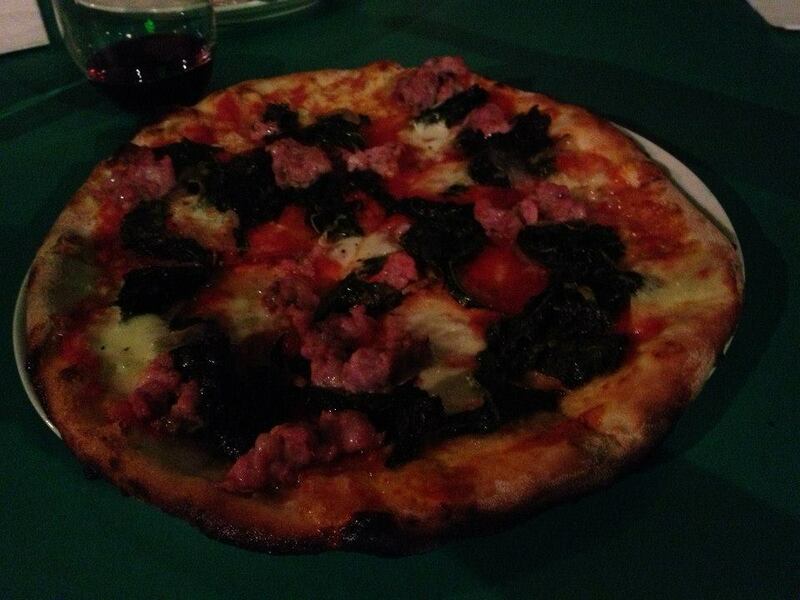 The smattering of freshly torn basil leaves on top had really enhanced the flavours. So good! Thankfully there was still some room for dessert as I had heard it on the grapevine that there was something pretty special about the soft serve. The “Sweet Things” selection was only three items long – Tiramisu donut ($5), Nemesis Choc Cake ($11) or the Ace Soft Serve ($7). Mrs M and I both went with the soft serve, while Mr M decided to tackle the donut. GG passed on ordering his own but I knew I would share mine with him. I’m nice like that 😉 So I wondered what would be so special about the soft serve? It all became apparent when it arrived. Two generous cups of soft serve arrived on a tray, along with two smaller cups – one filled with honeycomb pieces and the other with biscuit bits. Then there were two bottles, one had sort of like a homemade ice magic, a chocolate wonder, but the highlight was the bottle of salted caramel sauce. It was divine! Both Mrs M and I ensured that we enjoyed a high caramel to ice cream ratio, almost continuously swirling more and more caramel into our cups. Couldn’t get enough of the stuff and around the table folks agreed that it was liquid magic. This is how grown ups should eat soft serve – yum! The donut was also said to have been nice. Looked a lot like a big jam donut, but instead of jam it was filled with a rich tiramisu cream. Looked pretty good, but I had no regrets with what I ordered. Thoroughly enjoyed the first visit to Ace Pizza and can’t wait to head back again soon. 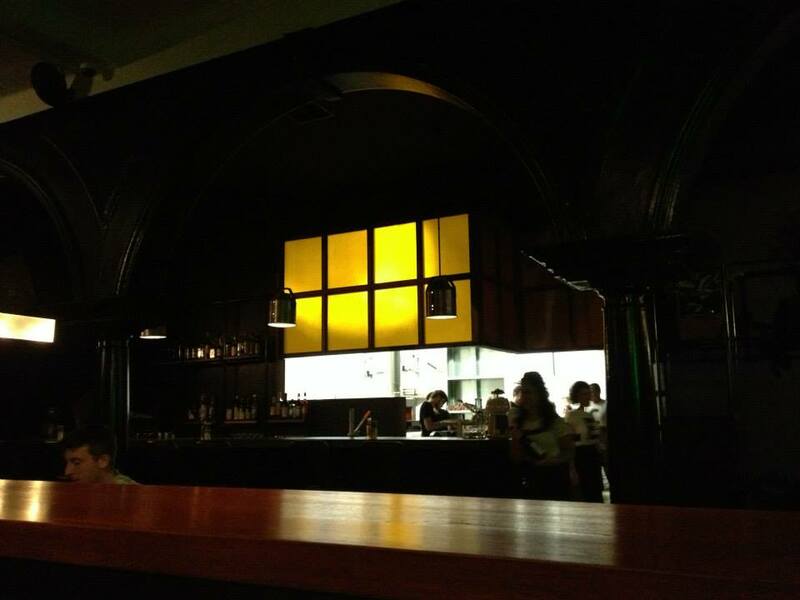 Great, friendly service, cool fit out and fabulous food. I read your lovely review! Sounds like we both have reasons to head back 🙂 yum!